The JEF hosted its first Spelling Bee contest on November 11th, 2007. 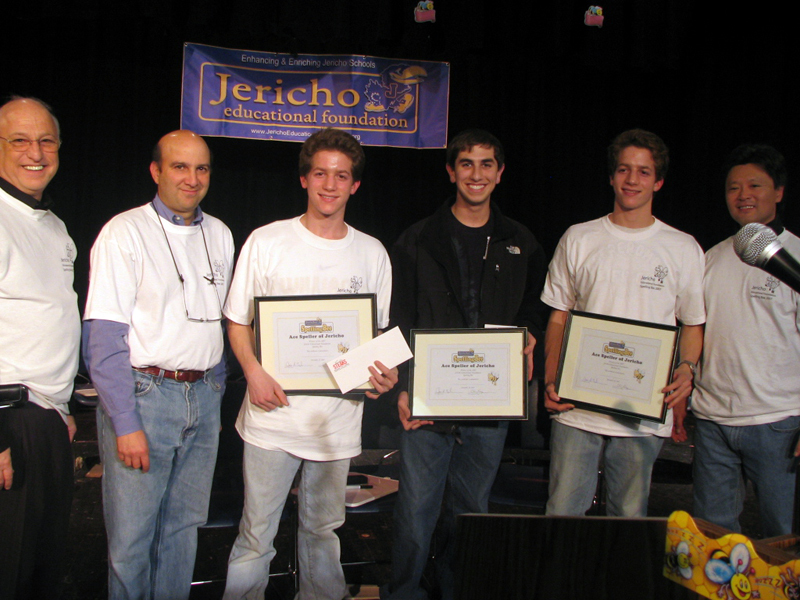 Twenty teams consisting of high school students, parents, faculty and community members battled to be” Best Spellers In Jericho”. The event proved to be a fun-filled evening attended by family, friends, and school faculty. Judges Dr. Elaine Margharita, Nick Maraventano, Diane Antonucci, Time Keeper Barbara Bauer and Word Caller Dan Salzman kept the event moving along and lively. The winning team members were David Weiss, James Gladstone and Michael Gladstone. The JEF presented the winners with a $300 gift certificate to Frank’s Steak House and “BEST SPELLER IN JERICHO” certificate. Every competing team also received a Tee Shirt, Goodie bag and discount coupons to local businesses.